Ever wonder what happens to the water when it goes down the drain or toilet? Eventually, it ends up at a water reclamation facility, where it is filtered, cleansed and converted back into water that can be used for other purposes, such as agricultural irrigation, replenishing surface and ground water, and sometimes conversion back into drinking water. Water reclamation facilities are equipped with many huge holding tanks that collect, filter out and process waste. 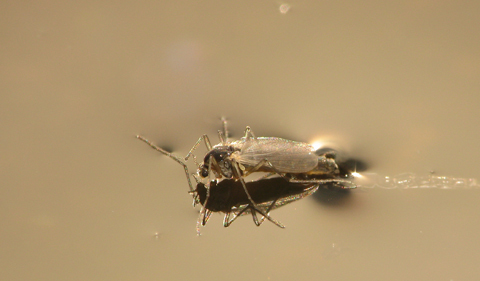 This provides an ideal home—cozy indoor facilities with plenty of sludge food on the menu!—for pest midge flies. A midge fly enjoys a meal. Photo by Sean McCann, with permission. And eventually the population can get out of control, impacting the lives of workers and nearby residents. Employees work while their eyes, ears, mouth and nose are accosted by thousands of midges, making it hard to breathe. To help combat pestiferous midges, two Ohio University Biological Sciences faculty, Dr. Bekka Brodie and Dr. Kelly Johnson, put together a team of undergraduate researchers supported through the Delaware County Board of Commissioners, Rush Elliot Funds, and Ohio University Voinovich School. Midges are tiny, delicate flies that somewhat resemble mosquitos, and about 20,000 midge species have been described worldwide. 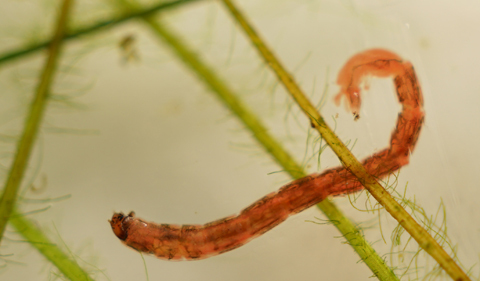 Midges spend the majority of their life feeding on decaying aquatic material (like human waste) as a small larva, also known as a “bloodworm,” for about two weeks. A larva of a non-biting midge larva (also known as bloodworm). Adults have very short life spans, of 1-2 days, and their sole purpose is to reproduce. For this, they gather in huge swarms of millions of flies in a single night. While in nature these swarms are decimated by hungry bats and birds, these swarms thrive in the predator-free water reclamation plant indoor facilities. In these conditions, midge flies can become a significant nuisance to employees, who may breathe them in or get them in their eyes or mouths while working around the treatment plant grounds. The nuisance may eventually escalate to respiratory problems including allergies, asthma and rhinitis. Additionally, midges are known to be vectors for disease causing pathogens. In severe infestations, the aquatic larvae impact the amount of wastewater being processed and the quality of the treated water; they damage pumps and moving parts and clog filters. Current control methods include insecticides that prevent larvae from developing into adult flies, or chlorine that kills larvae and breaks down before entering the environment. Unfortunately, these methods are expensive due to the sheer quantity required to suppress the midge populations, and often the relief only lasts a short time before the midges reestablish themselves. 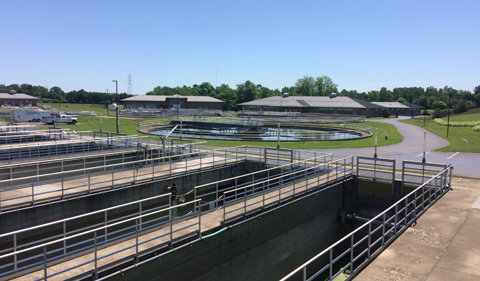 Longer lasting methods that are also environmentally friendly and cost-effective are direly needed for managing midges at water reclamation plants. To tackle this problem, Ohio University researchers spent this summer investigating communication pathways and resource foraging in midges, as well assessing commonly-used insecticides, using a combination of laboratory assays, field experiments, and surveys. 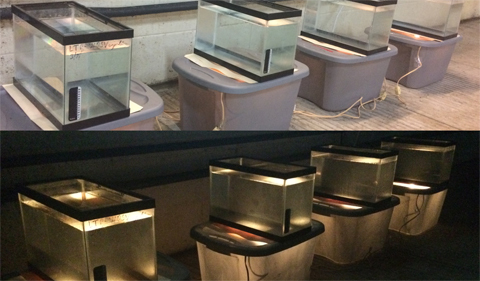 Alum Anna Pasternak ’18 experimented with testing egg-laying at water resources with polarizing filters and various light intensities. Anna Pasternak (’18 B.A. in Biological Sciences—Environmental Biology) explored the use of polarized light as a oviposition cue for female flies seeking water for egg laying by using polarizing filters at various intensities. 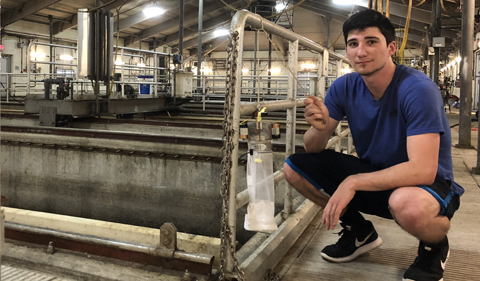 Honors Tutorial College student Mitch Duffner with bioassaying flashing LED lights, mimicking midge wingbeat frequencies at Alum Creek Water Reclamation Facility. Mitch Duffner, a third year Honors Tutorial College (HTC) student, investigated the elaborate visual systems of swarming midge flies and mimicked flashes of light produced from fly wings. Undergraduate student Amanda Frazier compared various insecticides, as well as rearing and counting midge flies. 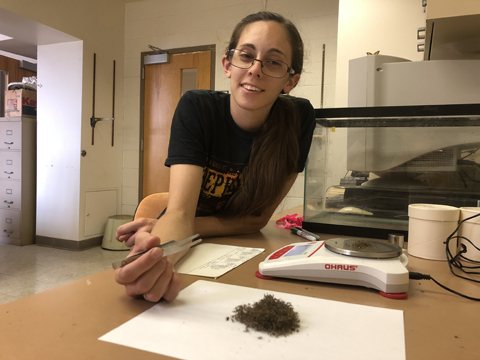 Amanda Frazier, a third-year Wildlife and Conservation major, researched the pros and cons of commonly used and environmentally friendly insecticides for lab testing. In addition to pursuing their own research projects that they will present at next year’s Student Research and Creativity Expo, the students learned about pest management and natural history of flies, and acquired skills in research design, techniques, and reporting. 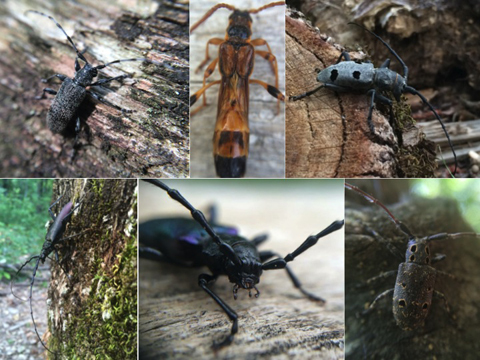 Find them on Twitter @BugswithBekka, #OUinsects, #MidgeManagementOH.